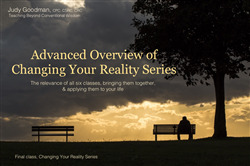 FINAL Class of the "Changing Your Reality" Teleconference Series: Advanced Overview of Changing Your Reality Series with Judy Goodman. 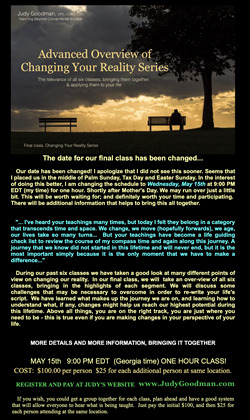 During our past six classes we have taken a good look at many different points of view on changing our reality. In our final class, we will take an over-view of all six classes, bringing in the highlights of each segment. We will discuss some challenges that may be necessary to overcome in order to re-write your life's script. We have learned what makes up the journey we are on, and learning how to understand what, if any, changes might help us reach our highest potential during this lifetime. Above all things, you are on the right track, you are just where you need to be - this is true even if you are making changes in your perspective of your life.